A residency with Nancy Fairbanks includes hand-built pottery techniques, and stories of the history, culture, and daily life of the Pawnee Tribe in Nebraska. 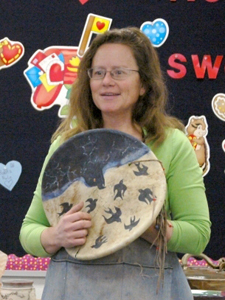 Her enthusiasm and knowledge of the history of the Native Americans, combined with her talents in pottery, make the workshop educational and fun. Students learn handbuilding techniques and ancient pit-firing methods. Through this primitive art form, she hopes to encourage awareness of the history of our area and interest in the art of pottery. Nancy has been a studio potter for many years and enjoys experimenting with Raku and other unusual firing techniques. She graduated from NWU.